Diocletian (244-311) - After the death of Marcus Aurelius, the number of notable Roman emperors were few and far between. Basically there were two; Diocletian and Constantine (and so both made the chart). Although they are inexorably tied to one another and shared some similiarities, they were quite different. 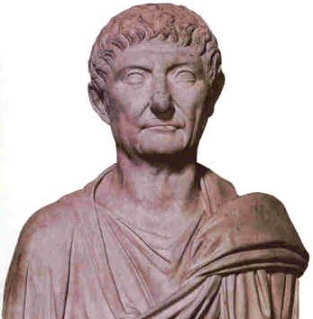 Diocletian was born into a lower class family in the province of Dalmatia, and like so many other leaders, rose through the ranks of the military. He served as a cavalry commander under Emperor Carus. During the 3rd century, the Roman Empire underwent a transformation (i.e. decline) which eventually led to its division, and succession of power was becoming increasingly confrontational. Carus died in battle against the Persians, and his son, Numerian, was assassinated after only a short reign. This opened the door for Diocletian. He was promoted to head up Numerian's personal detail, and upon the emperor's death, his soliders proclaimed him the new leader of Rome. But Carus had a second son named Carinus who also laid claim to the throne. Diocletian dispatched him at the Battle of Margus, leaving him as the sole ruler. Though he was the power of the empire, he realized it was in decay and took measures to run it as smoothly as possible. His reign as solo emperor did not last long. In 285, he appointed Maximian as co-emperor. This was the beginning of the separation of power which would eventually lead to the split of the Roman Empire into two, between East and West. Power was further delegated in 293, with the appoinment of two additional rulers, Galerius and Constantius, who were in effect, "vice-emperors". This "rule of four" became known as the tetrarchy, and lasted until 313 with the official split of the empire and reign of Constantine. On the military front, he engaged in several campaigns to the north and east, not to expand the empire, but to secure the borders and prevent contraction. In 299, Galerius achieved a significant victory against the Sāssānid Empire which led to a favorable treaty with the kingdom, finally bringing peace to the eastern border. But Diocletian had failures as emperor. The most famous was the persecution of Christians (see above). And in 301, he issued the Edict of Maximum Prices, which was an early attempt in history at price controls. The Roman economy was experiencing high inflation, and as an activist government advocate, Diocletian tried to correct it by direct intervention. It was a miserable failure and abandoned after a few years. His reign lasted little more than a decade before illness forced him to abdicate the throne in 305. He lived the final six years of his life in retirement and built a sprawling palace along the Dalmatian Coast (where he was born), where he mostly grew vegetables.